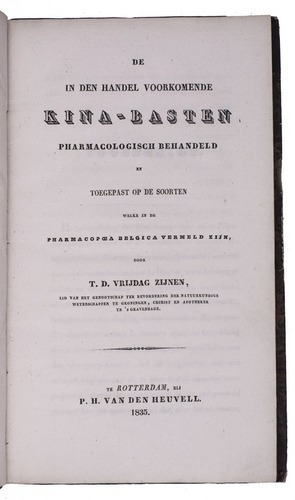 De in den handel voorkomende kina-basten, pharmacologisch behandeld en toegepast op de soorten welke in de Pharmacopoea Belgica vermeld zijn. Rotterdam, P.H. van den Heuvell (back of half-title: The Hague, A.D. Schinkel), 1835. 8vo. Contemporary half calf. 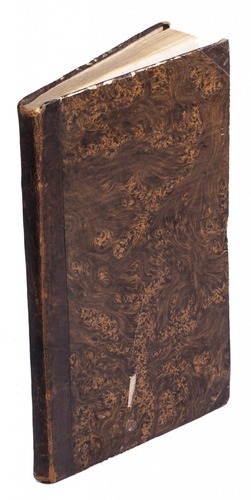 Rare first and only edition of a work on the Cinchona plant by Theodoor Daniël Vrijdag Zijnen (1799-1863). The bark of some species of Cinchona contains quinine, which was used in several medicines, especially in those against malaria. The book opens with sections on the history of the Cinchona tree, its physical appearances and how to obtain, split, store and categorize the bark according to its colour. The majority of the text deals with the trade in Cinchona bark, explaining how to distinguish real Cinchona plants and barks from fakes, either from very similar looking species or imitation bark that was offered for sale. 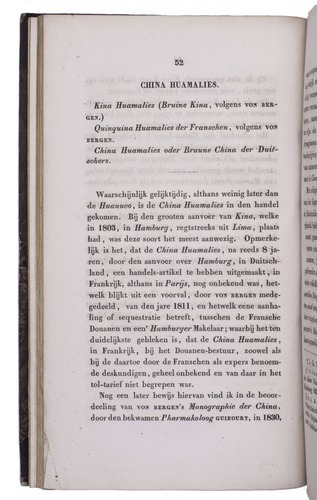 Vrijdag Zijnen describes the physical and chemical characteristics of the Cinchona species included in the Pharmacopoea Belgica. Binding slightly rubbed along the extremities, spine very slightly damaged at the head and foot, otherwise in very good condition. Bradley III, p. 724; NCC (6 copies); WorldCat (1 additional copy).